Bicycles come in different sizes, just like pants. While you can ride a bike that’s not quite the right size for a short distance, the more you ride, the more important it is to choose the correct size. Typically, production bicycle frames are available in three to six different sizes, and the specified size refers to the length of the seat tube (see diagram) in centimeters. This measurement is normally taken from the center of the bottom bracket to either the middle or top of the top tube. 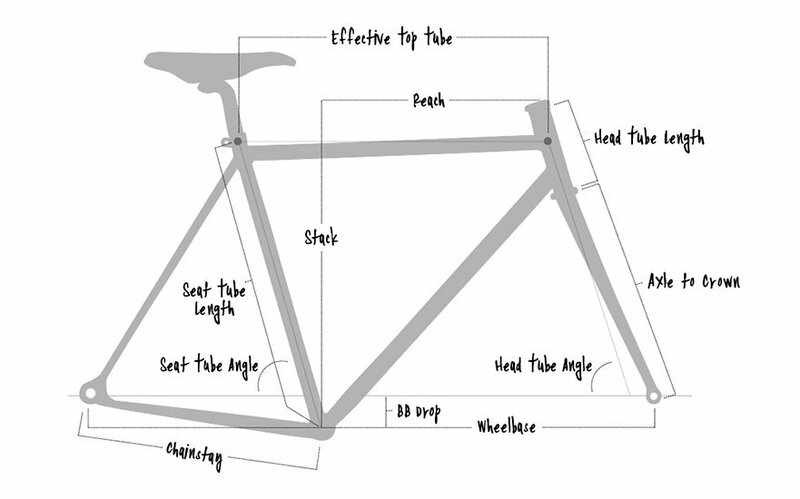 See the diagram below for other common bike frame measurements used in determining your bike's fit and function. Standover height is just what it implies – you put your leg over the bike frame with the shoes you intend to ride in, and stand flat-footed on the floor. If the bike has a flat top tube (the same height at the handlebar end as the seat end), you should have an inch or two of clearance between your crotch and the top tube, more if the top tube is sloping. This is a good method of determining frame size and ensures you’ll be able to stand comfortably with both feet on the ground while waiting in traffic. What stand over height doesn’t accurately measure is the distance between the saddle and the pedals, which is where you’ll be spending the majority of your time while cycling. If you don’t have the actual bike handy, and the manufacturer provides the standover height, you can measure your inseam and pick a frame size that will fit. To measure your inseam, stand flat footed with shoes off and put a carpenter’s level between your legs. Pull the level up snugly enough to approximate the pressure of your weight when riding, making sure it’s parallel to the ground. Have a friend measure the distance from the top of the level to the ground, and write down the number. It’s normally more convenient to use centimeters, as that’s the standard within the bike industry. PS, wear bike shorts or underwear when you do this; if you measure while wearing jeans the measurement will be short. Personal physiology, amount of time spent on the bike, and flexibility all play a part in how high to set your saddle. You can adjust the distance from the saddle to your pedals by moving the seat up or down. Normally this is done by loosening the bolt holding the seat post with an Allen wrench, raising or lowering the saddle, then re-tightening the bolt. Some bikes come with a quick-release to allow this adjustment without tools. One common method of figuring out your saddle height is the Lemond Method (from Greg Lemond’s Complete Book of Cycling). Measure your inseam as described above and multiply that number by .833 to get the distance from the top of your saddle to the center of the bottom bracket. Keep in mind that this recommendation is for experienced cyclists, so if you are new to cycling you may want to begin with your saddle a centimeter or two lower and raise it gradually as you get used to the bike. The length of your bike from saddle to handlebars needs to fit you, too. Most methods of calculating this distance involve measuring your torso length and arm length and using a formula or bike fit calculator, but the truth is what will be comfortable is highly personal. You’ll want to arrive at a cockpit length that lets you ride with your upper body angled forward and arms comfortably bent. The ideal position varies a lot depending on how you plan to use the bike, your body type, and how flexible you are. You can adjust the length of your cockpit by changing the length of your stem or moving the saddle backward or forward. Stems are usually available in one centimeter increments; if you’ve ridden your bike for a few weeks and feel that you’d like to be more upright or stretched out further, you can change to a different length stem. Most saddles have several centimeters of fore/aft adjustment, too, but moving your saddle can affect your pedaling dynamics and weight distribution on the bike. Remember that your handlebars can also be adjusted for height – most recreational cyclists prefer their bars level with or slightly lower than their saddle, while racers typically prefer their bars 3 or more inches lower than their saddle. Casual cyclists, on the other hand, may be fine with bars quite a bit higher than their saddle. Bike saddles can be tilted as well as moved forward and backward, usually by loosening the same fasteners. A level saddle is suitable for most people, as it offers the best compromise between comfort and holding you securely in place. Some riders, women especially, find that tilting the nose (front) of the saddle down slightly increases comfort, but it can also increase fatigue in your arms as you’ll tend to constantly slide forward. If you can’t find a comfortable saddle angle after a few weeks of riding, consider changing saddles – there are many different shapes that may work better with your anatomy. Handlebar choice and brake lever position also affect your position on the bike. Riding a flat or riser bar will put you in a more upright position than riding with your hands on the brake hoods of a drop bar, and riding in the drops will make you lower and even more stretched out. Handlebars also come in different widths; if you feel like your hands are too close together (make breathing more difficult) or too far apart (less aerodynamic) you can switch bars – most people prefer a neutral width about as wide as their shoulders. Finding a riding position that fits your riding style and body type is the most important thing – don’t be afraid to experiment a bit, and expect to change your ideas about what’s comfortable as your riding habits change. If you're buying a new bike, one of the best ways to identify your perfect fit is through demoing different sizes, models and brands. Mountain bike demos are available at each of our stores in Seattle, Portland, and Denver.